Crisis communication during natural disasters, as well as issues surrounding online sexual identity, will be examined in detail by the QUT Social Media Research Group's two newest researchers. Meg Jing Zeng and Stefanie Duguay recently joined one the Creative Industries Faculty's top-level research groups, coming to QUT from University of Oxford where they earned Masters degrees in the Social Science of the Internet. Jing is studying how social media is used in natural disasters in China and Australia; Stefanie is studying the ways gay, bisexual, transgender and queer (LGBTQ) people 'come out' in different social media environments. Having experienced the 2008 Sichuan Earthquake in China, a 7.9-magnitude earthquake that caused the death of about 70,000 people and left more than 10,000 people missing, Jing believes that information and communication technology has great potential to facilitate communication management and disaster relief efforts. "I witnessed the desperation and helplessness of human beings in a devastating disaster, but at the same time I also saw solidarity and perseverance," Jing said. "After six years studying media and the Internet, I just can't help but think about what it would be like if smartphones were as popular then as they are today; if social media had already become a big thing in China, if geo-location technology was as advanced then as it is today," she said. "There is nothing we can do to change what happened in 2008, but we can improve future practice of disaster relief efforts and communication management." Stefanie is planning to look at the difference 'coming out' on various social media sites can make for people with diverse gender and sexual identities. "In doing so, I want to see if an accumulation of highly personal expressions can make a difference at a population level. Basically, I want to know if social media can help us make 'the personal is political' ring true again," the 28-year-old said. The Canadian researcher hopes her research will provide a significant theoretical contribution to digital media studies. She said digital technologies and the way people use them are always changing, challenging researchers to constantly apply new perspectives. "It's not that everything to do with the Internet is always 'new', which is something we hear too often. It's that digital media tend to add dynamics to social situations that require you to look at them differently," she said. According to the two researchers, the Creative Industries Faculty's Tier 4 Social Media Research Group has a great international reputation, and the combination of supervisors, skills, tools, and expert knowledge convinced them to relocate. "Before arriving, I was already reading Associate Professor Jean Burgess' work and research from recent QUT PhD graduates who have studied similar topics," Stefanie said. "Professor Ben Light's work on the expression of gender and sexuality on social media as well as his investigative approach to everyday uses of digital media have been extremely informative to my research." Associate Professor Jean Burgess said the students were attracted to QUT because of the international reputation of its media and communication research, which they were introduced to during their studies at the Oxford Internet Institute. "QUT has a longstanding relationship with the Oxford Internet Institute, successfully winning places for a number of PhD students in its highly competitive summer doctoral programme each year," Associate Professor Burgess said. 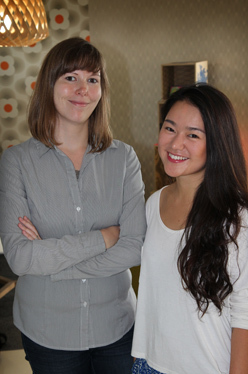 Oxford Internet Institute graduates and QUT Social Media Group researchers Stefanie Duguay and Meg Jing Zeng.